Insider: PT: Oath of the Gatewatch Coverage! Kelly Reid and I (Doug Linn) are here in Atlanta, covering the Pro Tour for our Insiders! We’re going to send you the financial news that you need as it’s unfolding on the floor of the PT. This is Modern, so we’re expecting big breakout decks and card price swings over the weekend. We will be periodically sending out updates. You’ll have them emailed to you; we’ll tweet about updates; and we’ll post them here. No matter how you get your updates, you’ll be able to find them. We are here to help you. That means that we will research the stories that you want to know about. You can ask us questions on Twitter or on the forum thread (or at the bottom of this page) and we’ll answer them for you! The focus of today is the Eldrazi decks: what are the last cards to know about? What can beat it? Kelly and I just got off the floor and we’ve got notes for you. The Death’s Shadow deck can demolish the Eldrazi deck on account of its brutal speed. It forces the Eldrazi player to hold back blockers or get blown apart. I watched UWR Control versus UR Eldrazi; the former lost in three close games. Supreme Verdict was one of the more potent cards. I also saw Runed Halo(!). Eldrazi is capable of stopping Infect because the UR Eldrazi deck is running Gut Shot on the sideboard. It’s also got Stubborn Denial for serious disruption. Team CFB is running Ratchet Bomb in numerous numbers off the board. At under $0.50, it’s a spectacular pickup. Notably, it’ll kill Endless One and a field of Scions, as well as fight well against Infect and Affinity. I saw Eldrazi Obligator give the UR Eldrazi player’s own creature haste for a crazy attack. Obligator is a little better than I previously reported. At $0.25, it’s a fine target. More to come next round! The story of the day is, without a doubt, colorless creatures. Between the Artificial kind and the Eldrazi kind, cards without a color identity have been massively over-represented! 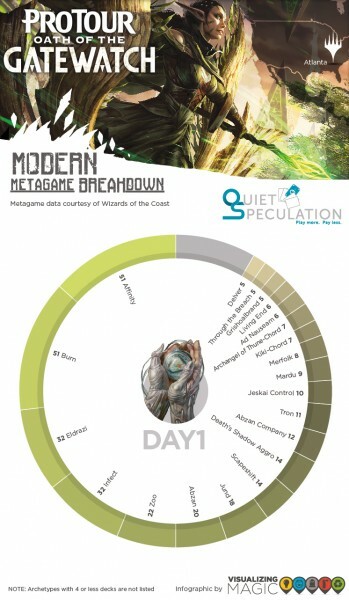 We begun the day with a metagame analysis that showed the Affinity / Robots / Ravager deck near the top of the field in terms of representation, with various Eldrazi lists not far behind. While there wasn’t much variation in the ‘bots lists (a strayTarmogoyf or two here or there, perhaps), the Eldrazi lists diverged along, ironically, color lines. We all knew going into this event that the base-black Eldrazi list was going to show up, but we did not expect to see a UR list come out. This list is getting some serious camera time in round 8 here at the end of Day 1, so let me tell you about it based on what we’ve observed at the top tables. First, four people from the same team brought the deck to the event, and three of them are 4-0 with the deck as of right now (their fourth teammate is 3-1). Second, it uses a lot of the same core cards you’d expect; Eldrazi Mimic, Thought-Knot Seer, Reality Smasher, etc. But it diverges from the base-black lists because it includes cards like Vile Aggregate (a 5-toughness trampler for 2R ), Eldrazi Skyspawner (yep. its not just draft trash), and Drowner of Hope (a bulk rare that might very well cease to be bulk after today). Coverage just confirmed that Drowner of Hope is a 4-of in the list on the feature match, by the way, so this might be a good time to acquire a playset or fifty, as they are currently bulk rares. Interestingly, the deck eschews Matter Reshaper. Paraphrasing one teammate, that card “doesn’t actually do anything”. It’s just value, which is not how this deck likes to play. Anyway, here are some rough stats of what’s at the top tables right now. We’re looking at these because they’re locks for Day 2, and they’re more likely to Top 8 than most. Remember that these players are at the top because they assuredly 3-0’ed their draft, so this is not commentary on the decks themselves, just their likelihood to end up in or near the Top 8. We cut this list after the top 40 tables (80 players), these numbers are approximated. Also, this doesn’t count the decks in the feature match area, but those have been consistently representative of the field as a whole. It’s clear-cut. The colorless creatures continue to consistently crush control and combo decks. I think it’s very safe to call OGW Eldrazi the breakout deck of the tournament. Many of the cards are already expensive, but you can still get your Eldrazi Mimics cheap-ish, and I’d be shocked if Drowner of Hope remains bulk for much longer. Remember, we still have at least 6-7 rounds of Magic to play before we have an inkling about Top 8, so a lot can change; the UR Eldrazi crew could all scrub their drafts, for example, and never see the Light of Day again. Some of these decks are under-represented, but it only takes one in the Top 8 to send players into a buying frenzy. It’s been an awesome day here in Atlanta, and we’ll be back online bright and early to get the coverage started again. Thanks for reading! Drowner of Hope: bulk rare, but integral to the deck. It takes over the board when it comes down. Endless One: At $1.25, a great pickup. It doesn’t play well with Matter Reshaper (they don’t run it) but it’s understandably fun with Eldrazi Mimic. Eldrazi Mimic: These had a run earlier in the day but they’re still decently cheap. Thought-Knot Seer and Reality Smasher: four-ofs, but probably not as much room for growth. Eldrazi Obligator: we saw a few of these, where they did decent work. Maybe not a critical card, but a good role-player. Vile Aggregate is a good foil pickup. The deck also runs four Shivan Reef. They’re around $4 and there are a bunch of copies, but in many ways they are better than Steam Vents in the deck because they make colorless mana. The deck has a single Gemstone Caverns, but it’s not been reported as astounding – just a good, solid card. In short, we like Drowner, Mimic, Endless One, with foil Obligator and Aggregate as good foil targets. Kelly and I recorded the Top 25 players in the world’s deck choices for the event. Some sit at the highest tables today, while some are at the very bottom. This list showcases what decks they thought were the smartest choice for the event today. We have purposely rearranged them so that there’s no way you can find out who was playing what. As you can see, a lot of Eldrazi! Kelly and I just got off the floor from Round One. What an event! There’s a lot of cool stuff to talk about. Kelly is writing up the metagame tally right now and I’m sharing our notes. Wild Nacatls everywhere. There’s a surprising amount of Naya Zoo floating around. Almost no Cryptic Commands in the entire room. I saw several Nacatl zoo decks that ran Mishra’s Bauble and Death’s Shadow. They often run Swiftspear and one also had Street Wraith. Many of the pros are running Infect. Mardu! Kelly and I counted at least 6. Pia and Kiran, Lingering Souls, Dark Confidant and/or Painful Truths. One player was running Chord of Calling with Retreat to Coralhelm, probably making a Knight of the Reliquary quite large. Only one Lantern deck, so breathe easy; we are not going to have to suffer through it on camera (I hope). We saw a few decks running Through the Breach in a base-blue shell. Eldrazi is present; we saw Chalice of the Void and Simian Spirit Guide in a few lists. Lots of Liliana of the Veil. Next round, Kelly and I are going to do our best to find out what the Top 25 players are playing (without anyone’s name associated with anything). That should give us a good idea of what the pros feel constitutes the best list. Nobody knows how Modern works after the bannings. This includes the pros. Midrange decks look very attractive; these include Jund, among others. There are a few levels of play; the aggro decks get beat by the midrange decks, which get beat by the big mana decks (which lose to aggro as well as combo like Infect and Storm). The pro predicted that a lot of players are going to “level up” that chain, looking at something like combo or a big mana deck. This may mean that the Eldrazi deck has a glorious weekend, but our Pro felt that nobody knew how to build that deck correctly… yet. We are about to go to the venue and we’ll report back again soon! Doug Linn has been playing Magic since 1996 and has had a keen interest in Legacy and Modern. By keeping up closely with emerging trends in the field, Doug is able to predict what cards to buy and when to sell them for a substantial profit. Since the Eternal market follows a routine boom-bust cycle, the time to buy and sell short-term speculative investments is often a narrow window. Because Eternal cards often spike in value once people know why they are good, it is essential for a trader to be connected to the format to get great buys before anyone else. Outside of Magic, Doug is an attorney in the state of Ohio.Â Doug is a founding member of Quiet Speculation, and brings with him a tremendous amount of business savvy.